I didn't ever think I would be a wallpaper person. It makes me think of old rented flats, wth ancient woodchip paper peeling off the wall, or dull dull dull patterns for old ladies who live in bungalows. ButI keep coming across quirky, interesting, bright patterns, and I think I'm starting to be converted. I wouldn't want to cover my ENTIRE house with it (nor could I, in any way, afford it), but maybe a feature walls? Feature walls are still cool, right? 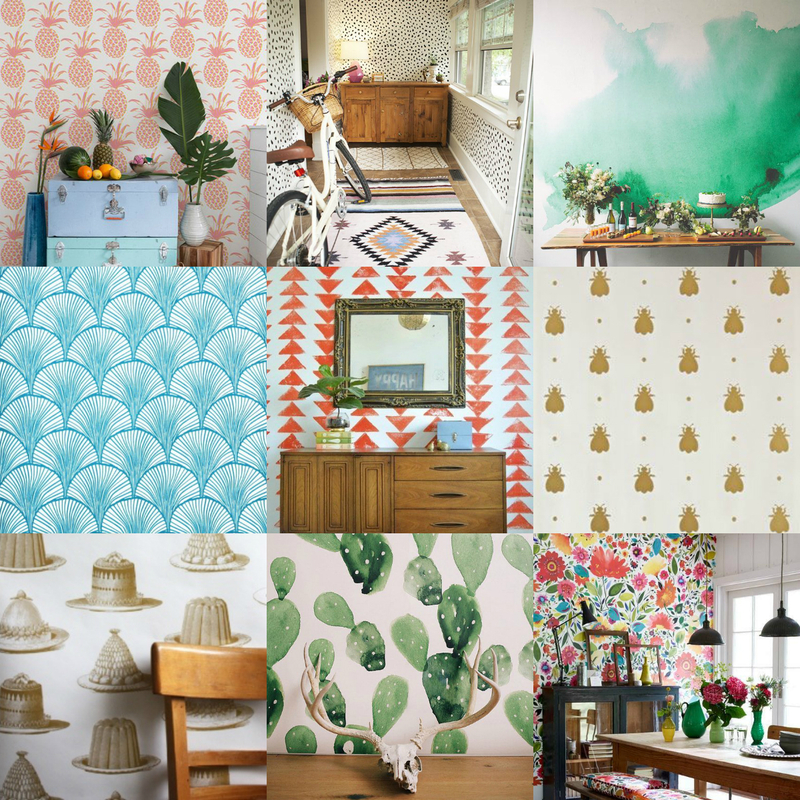 I've started an entire pinterest board dedicated to wallpaper, because I have become that house-obsessed person. But look at it! I'm still undecided on what colour scheme to go for in my bedroom or study, and possibly this could be the way to go. I am a big fan of bees, so I couldn't quite contain my joy when I found the bumble bee Farrow & Ball wallpaper. It's pretty pricey at £85 per roll (although, to be honest, I have no idea what 'normal' wallpaper should cost), but I also found a cheaper decal equivalent on etsy, which looks like it would be considerably less effort too (and easier to change up, if you were fed up of living in a hive). The cactus print is also from etsy, and isn't traditional wallpaper either. Instead, it comes in four big panels, which can be ordered in whatever size you need. I love the polka dots too - I think that image is of actual wallpaper, but you can easily buy (or make!) little decal dots to stick on your walls. Caroline from burkatron did a cute triangle wall decal tutorial recently, which I like a lot, although, would it be too busy in a small-ish space? Would it hurt your head? And, how amazing is that jelly and cake print by Thornback & Peel? They currently have no wallpaper left on their site, as they are about to launch a new range, so I am waiting impatiently to see what it is. Wouldn't that print be AMAZING in a kitchen? Or would it be too kitsch? Aah, there are just too many options - how on earth do you choose? I like the watercolour paper best. I think that would make an awesome statement wall! Definitely! I love how the plants look against it too.